The names of these classifications can be changed, the classifications can be removed and additional classifications can be added. If you click on 'add' you will see a list of all members of the directory so you can choose another. 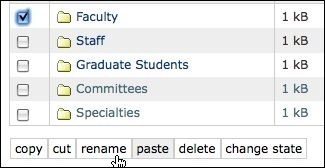 If 'Graduate student' is selected in a person's profile as a category, they will automatically appear in this list. Go to the home page of your directory and click on the 'contents' tab on the editing bar. 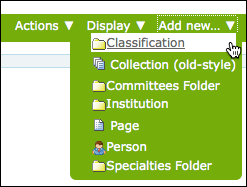 Check the left-hand box next to the folder you wish to change - in this case 'Faculty' - to rename click on the 'rename' button at the bottom of the table. Complete the Short Name and Title for the new classification and save.